Welcome back to another edition of the Wire Troll All-Stars. It’s time to honour our bargain-basement studs once again, just as you should honour them for saving your Fantasy team in a pinch. Without further ado, here are our picks for the top Fantasy baseball waiver wire additions of the 2015 season. Kyle Schwarber, Chicago Cubs: Schwarber tore it up almost right out of the gate once he arrived on the scene, even as he spent a lot of time in the outfield despite his draft status as a catcher. Still, he ended his rookie campaign with 16 home runs and was almost universally owned in ESPN and CBS leagues. Honourable Mentions: Miguel Montero, Chicago Cubs; and J.T. Realmuto, Miami Marlins. Mitch Moreland, Texas Rangers: Moreland had a stellar season despite the fact that Prince Fielder returned to form and the team traded for Mike Napoli. Moreland clubbed 23 home runs for the AL West champs while driving in 85 runs and posting an 812 OPS. Oh, and he can pick it at first base as well (see video below). Honourable Mentions: Justin Bour, Miami Marlins; Chris Colabello, Toronto Blue Jays; and Adam Lind, Milwaukee Brewers. Brock Holt, Boston Red Sox: A few things to note on Holt: First, we had to make him a WT All-Star because he was an actual All-Star this year. Second, he’s a jack of all trades and seems to qualify at just about every position. But his production was solid throughout, and it’s that versatility that made him a great Fantasy pick-up. Honourable Mentions: Stephen Drew, New York Yankees; and Jedd Gyorko, San Diego Padres. Maikel Franco, Philadelphia Phillies: Franco was a legitimate Rookie of the Year candidate for a good part of the year (although he failed to garner a vote as some other freshman third baseman ran away with it) and he’s a worthy WT All-Star candidate, hitting 14 home runs and driving in 50 runs. Honourable Mentions: Yunel Escobar, Washington Nationals; and Trevor Plouffe, Minnesota Twins. Francisco Lindor, Cleveland Indians: The highly-touted Lindor lived up to his billing once he finally broke onto the scene, batting .316 with 12 homers and 51 RBI in less than 100 games. His 12 stolen bases were a nice treat for Fantasy owners, as well. Honourable Mentions:	Didi Gregorius, New York Yankees; and Wilmer Flores, New York Mets. 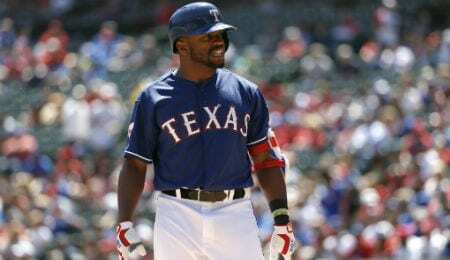 Delino DeShields, Texas Rangers: The second coming of Delino DeShields – sort of – quietly had a great year for the Rangers while putting himself in the discussion for Rookie of the Year honours (although he failed to be a finalist). He racked up 25 stolen bases. Stephen Piscotty, St. Louis Cardinals: Piscotty was remarkable in limited action in the big leagues, hitting for power and average after his long-awaited call-up after the All-Star break. Carlos Beltran, New York Yankees: We saw flashes of vintage Beltran at times this year, as the veteran helped carry the Yankees’ offense for parts of 2015. Honourable Mentions: Jackie Bradley Jr., Boston Red Sox; Marlon Byrd, San Francisco Giants; Carl Crawford, Los Angeles Dodgers; Adam Eaton, Chicago White Sox; Mark Canha, Oakland Athletics; and Odubel Herrera, Philadelphia Phillies. Anthony DeSclafani, Cincinnati Reds: DeSclafani had a stellar rookie season despite the predictable growing pains in a rotation that became exclusively freshmen by year’s end. He will be a fixture for years to come. Josh Tomlin, Cleveland Indians: Tomlin quietly had a dominant stretch down the stretch this season, helping hold down the fort in a deep Cleveland rotation that at times underachieved in 2015. Erasmo Ramirez, Tampa Bay Rays: Ramirez proved to be a valuable asset for a Rays’ rotation decimated by injuries in 2015. We recommended him as both a starter and a reliever, but he was especially effective starting. Lance McCullers, Houston Astros: McCullers gets lost in the shuffle a bit in a strong, young Houston rotation, but held his own, racking up more strikeouts than innings pitched. Marcus Stroman, Toronto Blue Jays: Stroman’s dominant return helps him make this list, as does his remarkable recovery from an ACL tear suffered in Spring Training. Honourable Mentions: Tommy Milone, Minnesota Twins; Matt Wisler, Atlanta Braves; Joe Kelly, Boston Red Sox; Luis Severino, New York Yankees; Dan Haren, Miami Marlins/Chicago Cubs; Mark Buehrle, Toronto Blue Jays; Tanner Roark, Washington Nationals; Chris Young, Kansas City Royals; Nathan Karns, Tampa Bay Rays; and Ivan Nova, New York Yankees. Jeurys Familia, New York Mets: When Jennry Mejia was suspended heading into the season, we recommended Familia in the season debut of the Troll, and he never looked back. Familia recorded career bests in WHIP and ERA while topping 40 saves. Oh, and then he added another five saves with a 0.61 ERA and 0.48 WHIP in the playoffs as the Mets came within three wins of winning the World Series. If you landed Familia on the wire early in the season, you struck gold. Kevin Jepsen, Minnesota Twins: Jepsen had a rebirth after being traded from Tampa Bay to Minnesota, effectively replacing Glen Perkins as the Twins’ closer down the stretch. Sergio Romo, San Francisco Giants: It wasn’t a typical Romo year, but he still managed to post a sub-3.00 ERA in 70 appearances while collecting a pair of saves. Honourable Mentions: Tyler Lyons, St. Louis Cardinals; Pedro Strop, Chicago Cubs; A.J. Ramos, Miami Marlins; Tom Wilhelmsen, Seattle Mariners; Keone Kela, Texas Rangers; and Bryan Shaw, Cleveland Indians. Now it’s your turn. Let us know in the comments below who your favourite Fantasy baseball waiver wire picks of 2015 were. Happ has turned things around in a big way since being dealt to the Buccos from Seattle — most importantly, he’s keeping the ball in the ballpark.